Sarnians driving home in a car once knew they were getting close by the smell of industrial air pollution. These days, the telltale sign they’ve arrived is a bumpy jolt of bad roads. “We know we’re back in town when we hit Mill Street and have to do zigzags in the middle of the night to make our shocks less vulnerable,” says John Dickson, a longtime critic of Sarnia’s neglected roads. 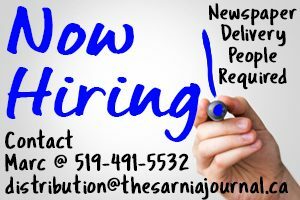 Sarnia has more than 150 kilometres of streets that, in the diplomatic language of city staff, have reached the end of their useful life. The difference between what’s required for street maintenance and what is actually spent on it each year — known as the infrastructure deficit — has ballooned under the guidance of successive city councils to $27.6 million. As a result, getting Sarnia’s broken streets back up to standard would require every woman, man and child in the city to ante up an extra $383. In its first budget, the current city council earmarked $2.3 million for road repairs this year. That’s considerably more than the previous council, which in 2015 spent just $1 million on roads. But it’s still less than what’s needed just to maintain the status quo, according the city’s Corporate Asset Management Plan. 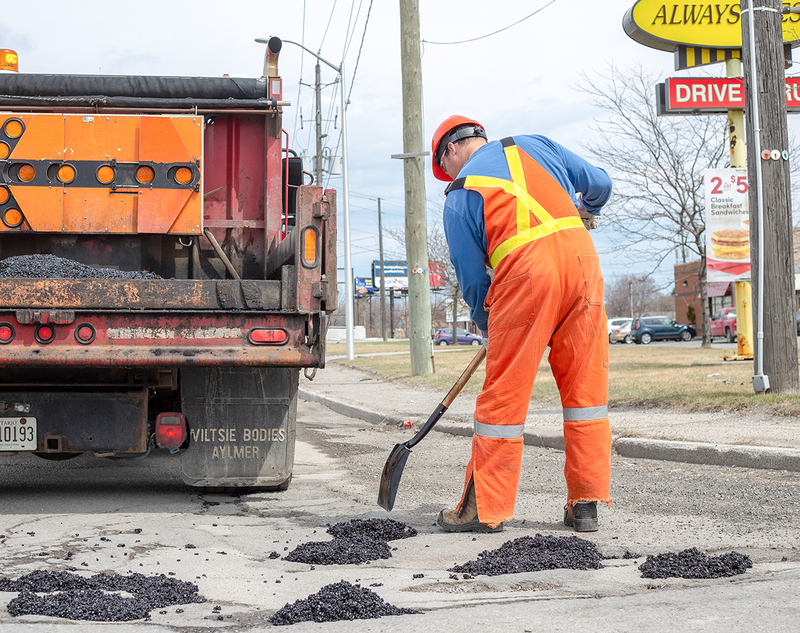 Each year, as more old asphalt wears out and the number of streets classified in “very poor condition” continues to grow, so does the infrastructure deficit — to a projected $37 million next year, the AMP indicates. The result is a mounting toll on the vehicles of residents and businesses alike. Chris Dietrich, owner of Goodyear Sarnia, said more than half the vehicles repairs done at his London Road shop are suspension, alignment and steering work. Due to the state of city streets? About 10% of vehicles normally require an alignment annually, Dietrich explained. But when customers switch their snow tires in the spring, many need a second alignment after just five months of winter driving, he said. Another city mechanic described how a customer’s vehicle began vibrating after hitting a pothole. A few kilometres later the wheel broke off, rolled across the median and struck an oncoming car. The city’s legal department declined to provide the number of insurance claims filed by car owners. The problem is especially noticeable right now after the winter’s repeated freeze-thaw cycle caused asphalt to crack up. A city cab company recently grounded one of its taxis because of chronic suspension and alignment. The manager, who declined to be identified, said a cab running 24/7 should typically need an alignment ever two years, yet some of his vehicles need servicing six times a year, he said. But road critic John Dickson said it isn’t all bad. After the former Tourism Sarnia-Lambton director penned a guest column in The Journal last spring decrying the state of Canatara Park’s road, City Hall took action. “Low and behold, they conceded to pave about one third of it, so I’m happy things are moving forward in that way,” he said.